Pressbooks Users have the ability to view statistics for each book that they are the Administrator of, thanks to the WP-Piwik plugin activated for the B.C. self-serve instance of Pressbooks. Statistics are displayed in a couple of places within a book. WP-Piwik numbers for the last 30 days are found in an Overview box on the lower-right section of a book’s Dashboard. This box comes with a collapse arrow to hide the information. To view detailed statistics, begin by selecting “WP-Piwik” from the Dashboard menu. 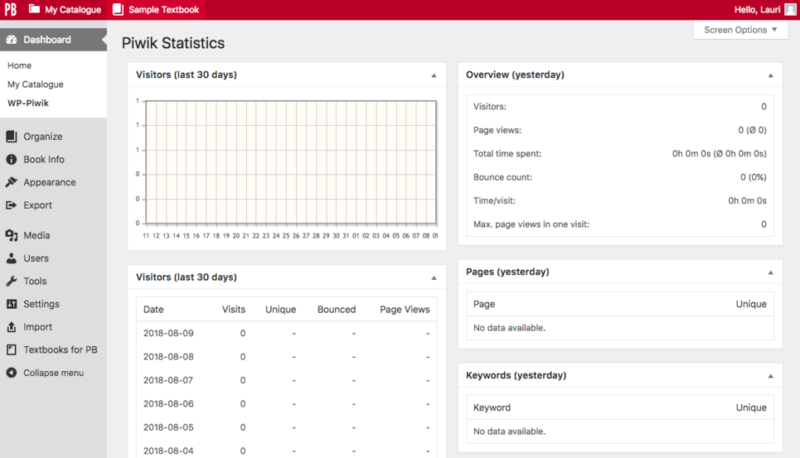 This action will reveal the Piwik Statistics page, which contains information about the webbook, such as the number of visitors that have looked it. See the Matomo Glossary for definitions of the metric terms used by this tool. IMPORTANT: WP-Piwik was renamed WP-Matomo on January 9, 2018. The announcement blog explained that the name was changed “to ensure that Matomo does not/will not share its name with any other businesses unlike Piwik. We also want to protect the Matomo brand and for it to remain the open source community project name forever.” The label for this plugin in Pressbooks has not yet been changed. Book Statistics Inside Pressbooks by Lauri M. Aesoph is licensed under a Creative Commons Attribution 4.0 International License, except where otherwise noted.